Today, the world mourns the death of Alan Rickman, as the actor always brought an enigmatic something special to every project on which he worked. Whether it was the charismatic terrorist Hans Gruber from Die Hard, the deeply flawed yet heroic Alexander Dane from Galaxy Quest, or even the voice of Marvin The Paranoid Android in The Hitchhiker’s Guide To The Galaxy, Rickman consistently provided the audience with memorable roles and performances that would stay with them well past the credits. One of his most lasting roles will inevitably be Professor Severus Snape from the Harry Potter films. Part of its legacy is just the number of films in which Rickman reprised the role, part of it is that so many people grew up on his scowling grimace, but much of it is the depth he brought to a role that wasn’t truly fleshed out until the third or fourth film, yet always felt like a real person thanks to Rickman’s performance. In honor of his passing is this collection of interviews done for the Harry Potter series, in which Rupert Grint (playing Ron Weasley in the films) admits to drawing a rather unflattering caricature of the imposing Mr. Rickman. 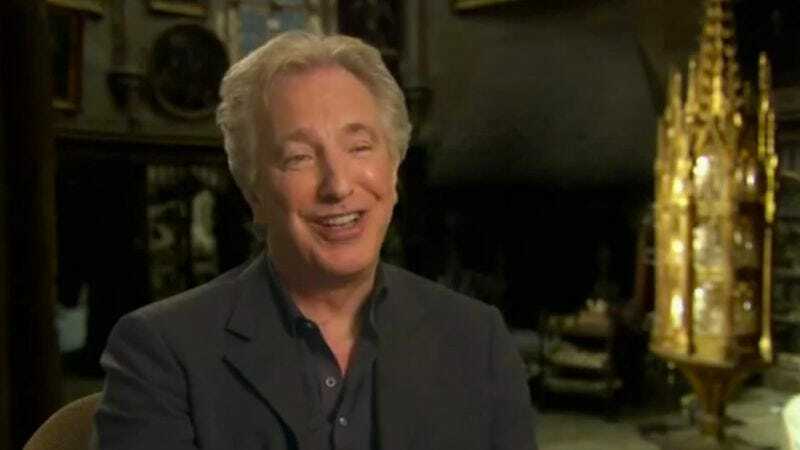 Rickman’s response to it is charming and goes to show that kind of warmth and joy that seemed to always reside within him, even when he was playing complex, misguided characters. It’s just a short anecdote, but goes a long way to display the type of man he was. As Rickman once famously said, “I don’t play villains, I play very interesting people.” He was a very interesting person himself, and his presence in this world will be greatly missed.